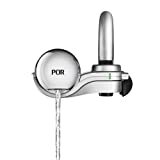 From PUR, the Three-Stage Horizontal Mount Faucet Water Filter features a chrome design and clicks onto any standard faucet–no tools required. Each filter is capable of cleansing up to 100 gallons of water (lasting two to three months, on average). The filter’s purification system keeps sediment, chlorine, lead, trace pharmaceuticals, microbial cysts, and other pollutants from reaching your drinking glass. In the final stage, water is filtered over natural minerals for a crisp taste. The filter swivels 360 degrees and has a convenient built-in replacement indicator. Snap it on. Drink it up. View larger. Three-Stage Filter Technology. View larger. The filter’s first stage traps sediment, like dirt, rust, and sand, while the second stage greatly reduces contaminants, pollutants, trace pharmaceuticals, and illness-inducing microbes. In the final stage, water is filtered over natural minerals to give it a more refreshing taste. The result is water that looks, tastes, and smells cleaner. 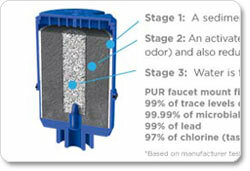 Each PUR filter provides up to 100 gallons of clean water, and will typically last for two to three months. The second stage of filtration employs an activated carbon microfilter that removes most of the harmful contaminants commonly found in both municipal water sources and well water. This filter removes 98 percent of chlorination by-products while also reducing the taste and odor caused by chlorine. The filter also removes 99 percent of heavy metals, like lead; industrial pollutants, like asbestos; trace pharmaceuticals, like antibiotics and antidepressants; and microbial cysts, like giardia and cryptosporidium. The filter’s one-click installation requires no tools; it snaps onto your existing faucet (filter is not compatible with pull-out faucets). Removing it is just as easy–simply push a button. The filter swivels 360 degrees to give you better access to your entire sink. A simple switch activates the filter and turns it off. For added convenience, this filter features a built-in electronic filter life indicator. The indicator flashes green, yellow, or red with use, so you’ll know when it’s time to update your filter. Faucet water filter and one filter replacement. 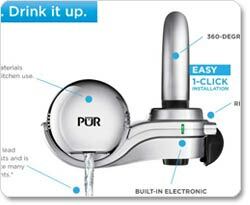 Which PUR Water Filtration System Is Right for You? *Natural Minerals: Water is filtered over natural minerals for a crisp and refreshing taste.